Some games just leap out at you right off the bat with a mesmerizing style, leaving you unable to look away. 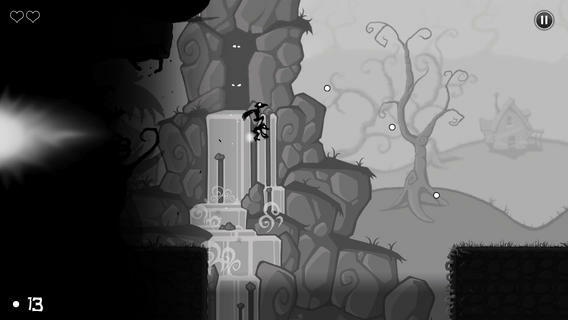 With a decidedly Limbo-like style, Crowman & Wolfboy ($0.99) brings enough to the table in terms of style alone to warrant some attention. In a pretty unique setup, Crowman and Wolfboy are actually evil beings. At least, they’re supposed to be evil, having been born as creatures of the night. But one day the duo wakes up and realizes that they’re sick of being bad, and want to fight their nature — so they start running. The only problem is, the other evil creatures don’t take too kindly to deserters, and start chasing the pair down to exact revenge. It’s that framing that provides the basic formula for the game — you’re going to be running through various levels in a platformer-like fashion, escaping a giant wall of darkness. If you happen to grab one of three light orbs littered across each stage, you can push back the darkness — but it’s an unrelenting darkness of course, so it’s only a temporary measure. To truly clear a level, you need to escape the darkness by getting to the goal, grab all three orbs, and rescue innocent creatures captured throughout the land of darkness. In other words, it’s a three star system you’ve seen many times before, but it has a little heart to it, and there is an incentive to go back and clear everything once you’ve mastered the basics and acquired new skills. One of the best parts of Crowman is that it straddles the line between platformer and endless runner. The controls are tight and responsive, and every error is going to be your fault. It’s really easy to get around due to the fact that all it takes is a quick swipe on one end of the screen to change directions, and an upwards swipe to jump. Based on those two quick actions you can perform long-jumps with Crowman holding onto Wolfboy, and wall-kicks, with the ability to strike back with attacks of your own later in the game. The visuals are also stunning in their own way, particularly due to the solid animation of the wall of death and the two heroes, and the soundtrack compliments the game perfectly (this is something you’ll want to hear headphones for). If possible, I recommend playing it on an iPad. You’ll be able to enjoy the art for a decent amount of time too, as the game features 35 levels, with a small handful of cutscenes to help facilitate the story. There’s also some bonus content to unlock, and the characters are likeable enough to partially invest in, to the point where you want to see where they end up. At its core, Crowman & Wolfboy operates like many runner games have before it. But with a unique visual style and a believably haunting world, it’s worth checking out, if only to see how slick the animation looks in action.